Opportunities to celebrate are important to us all. In the frenetic day to day life of a school, such occasions provide a welcome opportunity to pause, take stock and celebrate the achievements of students and to thank parents /carers for their ongoing support. The Sixth Form team recently welcomed Year 12 students to their GCSE Celebration Awards Ceremony. The event was warm and good humoured and it was lovely to see so many students supported by their friends and families. We were especially delighted to welcome the Robinson family who kindly sponsored a new award, the ‘Meir Robinson Prize for outstanding achievement in Music’. The prize was awarded to Joshua Gottleib and was an especially meaningful award as Mrs Robinson was a teacher at JFS for many years. This prize also gives the family an opportunity both to celebrate the contribution that Meir Robinson made to the Jewish community as well as his love for Music. 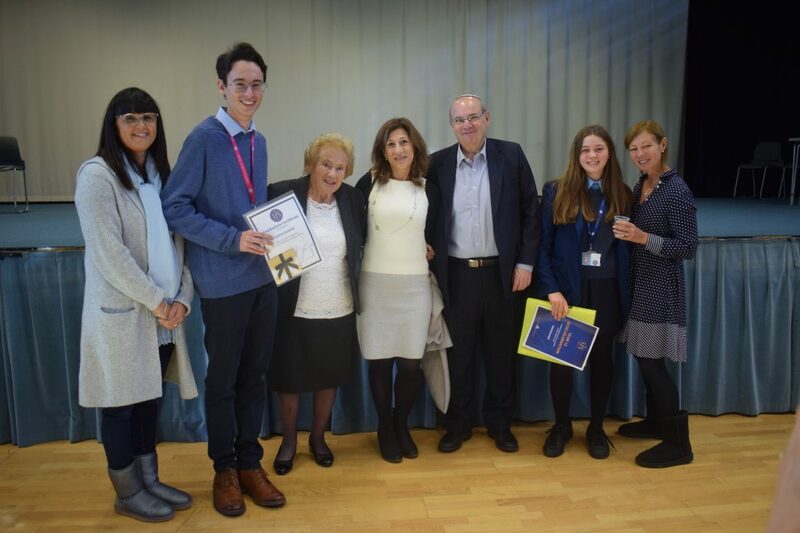 With five of his grandchildren having attended JFS we were honoured to host Mrs Robinson and delighted to continue the Robinson’s family involvement in JFS life. Many students received special prizes for outstanding achievement either in individual subjects or across a range of subjects. Congratulations to all students and we wish them continued success in their Sixth Form studies.